Figures culled by the National Rural Employment Guarantee Act (NREGA) Sangharsh Morcha, India’s top civil rights group fighting for strict implementation of India’s premier rural guarantee scheme, floated by the UPA government in 2005, have revealed that Gujarat is the worst pay master, highest highest gap among 20 major Indian states between officially declared minimum wages and NREGA wages. As against the officially stipulated minimum wages in Gujarat, Rs 298, NREGA workers in the state are paid, on an average, Rs 192 per day, suggesting that the difference between what they should be paid and what they are actually paid is a whopping Rs 106 for a day’s work, which is the highest in the country. While there are two major states – Maharashtra and Tamil Nadu – where the MREGA workers are paid “more” than their minimum wages, all other Indian states end up paying up less-than-minimum wages under the rural guarantee scheme. The scheme -- acclaimed by the World Bank in 2013 as “innovative practice” to promote financial inclusion, a U-turn from its earlier view that it was “barrier to economic development” – provides a legal guarantee for 100 days of employment in every financial year to adult members of any rural household, willing to do public work-related unskilled manual work. 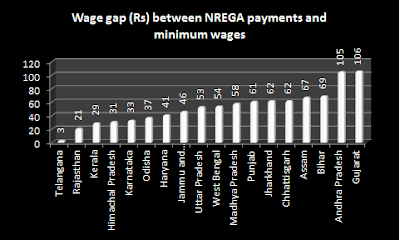 Ironically, the two states “paying” more under NREGA, have kept their minimum stipulated wages extremely low. Maharashtra’s officially declared minimum wage is Rs 194 as against the payment of Rs 201 for a day’s work under NREGA. Same is the case with Tamil Nadu, where the minimum wage is Rs 195, while the NREGA wage is Rs 205. The difference between the stipulated minimum wage and NREGA wage is Rs 105 in the case of Andhra Pradesh, where the officially declared minimum wage is 302, while payment under NREGA is Rs 197, followed by Bihar (Rs 69), Assam (Rs 67), Chhattisgarh and Jharkhand (both Rs 62), Punjab (Rs 61), Madhya Pradesh (Rs 58), West Bengal (Rs 54), Uttar Pradesh (Rs 53), and so on. Bringing this to light, in a letter to Narendra Singh Tomar, Minister of Rural Development, Government of India, NREGA Sangharsh Morcha has regretted that the Centre is “yet to notify the revised wage rates” for NREGA, yet muster rolls for the “next financial year are being issued at the 2017-18 wage rates”. Pointing out that, currently, NREGA wage rates of all the 29 states and Union Territories are “less than the corresponding minimum wage rates for agricultural work”, and the difference is “greatest in Tripura, where the MGNREGA wage rate is only 58 per cent of the state minimum wage for agriculture”, the letter tells the minister, “This ratio is 59 per cent for Sikkim, 64 per cent for Gujarat and 65 per cent for Andhra Pradesh” (click HERE for table). Asking the Government of India to immediately come up with a “notification of revised NREGA wage rates for 2018-19”, the letter demands “payment of compensation” calculating the difference between the minimum wages and NREGA wages paid till now, underlining, the NREGA wages should obligatorily be not below minimum wages in 2018-19. How did Modi succeed in hoodwinking EVERYBODY about the Gujarat model???????? According to MGNRGA provision in NREGA the agriculture MW or NREGA MW which one would be higher will allied. Agri MW is still 150 in Model gujarat.